Boosting sales and making more profit are the goals of every merchant. The best way to do it is to work with current customers and increase the average value of the shopping cart. Upselling and cross-selling products will be irreplaceable in this issue. Why do we think so? What is upselling and cross-selling and how to use them in ecommerce? Let’s consider this topic together and get the answers to all these questions. It is always more difficult and needs more effort and money to attract new buyers than work with the ones who have already made a purchase in your store. The current customer is usually more loyal and ready to buy more (of course, if the previous experience was positive). That’s why more and more webstore owners use up sell and cross sell. The “you might also like” block has become an integral part of every product page. Do you remember how merchants suggest taking a look at other products with better characteristics than the one you have chosen but a little bit more expensive? The same technique works online and is called up sell. Upselling takes place every time when you are encouraged to buy a more expensive premium version of the product you have chosen or complement the purchase with additional services such as support or warranty. Cross selling products are aimed at satisfying complementary needs to the original product. For instance, when a customer adds trousers to cart it would be appropriate to show him socks, a belt or a shirt. Choosing correct cross sell products will be very useful for customers and bring them extra value from shopping in your online store. 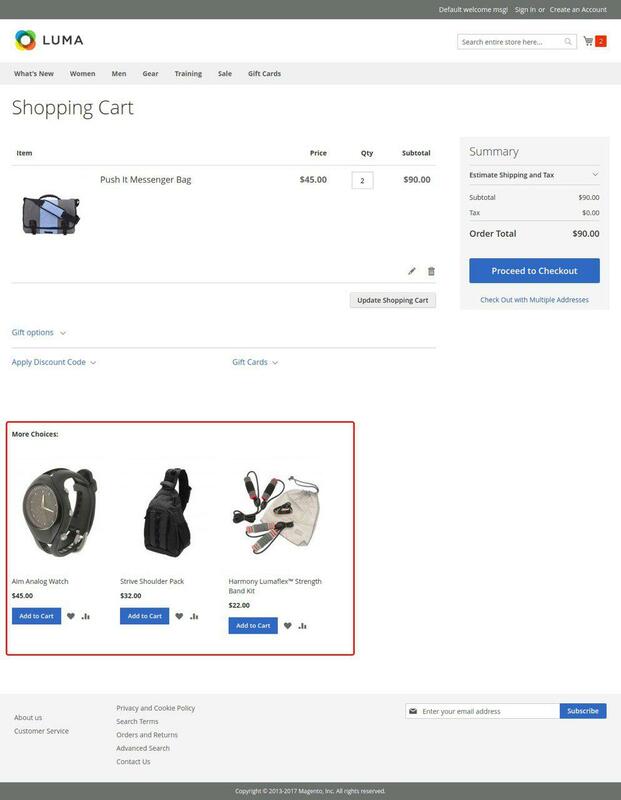 Showing products that other customers bought together with the one that a customer has chosen is also a working decision. It seems that up sell and cross sell are very similar. They both have the same aims: to increase sales, make more profit and gain customer loyalty. Products from these categories can be shown at product or checkout pages. You will never know which method will be more effective for you and where to add suggestions until you try. That’s why many companies use them together and that turns out to be quite beneficial. Take a look at how Apple added both up sell and cross sell products to the checkout page. Knowing the admin panel is necessary to bring your Magento 2-based webstore to success. Let’s see how you can easily add upselling and cross-selling yourself. If you want to dive deeper into the admin panel and make your webstore management more effective, you can always get Magento user training from the certified team. Step 1. Open the product in the edit mode. Step 2. 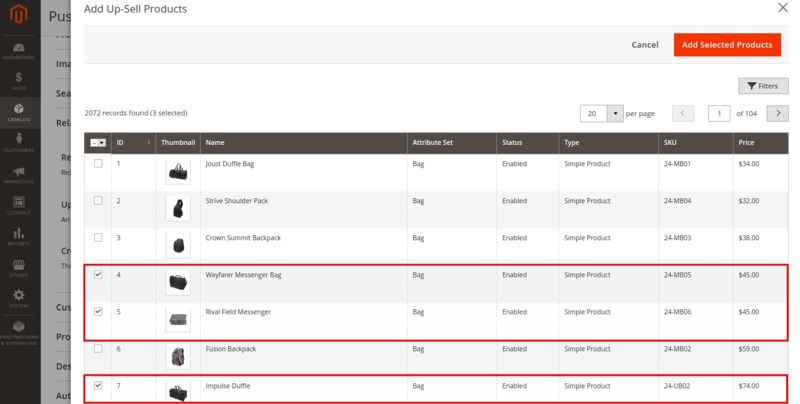 Choose the “Related Products, Up-Sells, and Cross-Sells” section, open it and press the “Add Up-sell Products” button. Step 3. In the opened window select the products you want to demonstrate as up-sell products. Then press the “Add selected products” button. Step 4. Remember to save the changes and check them on the front end. Adding a cross-sell is just as simple as adding an up-sell product. Step 2. 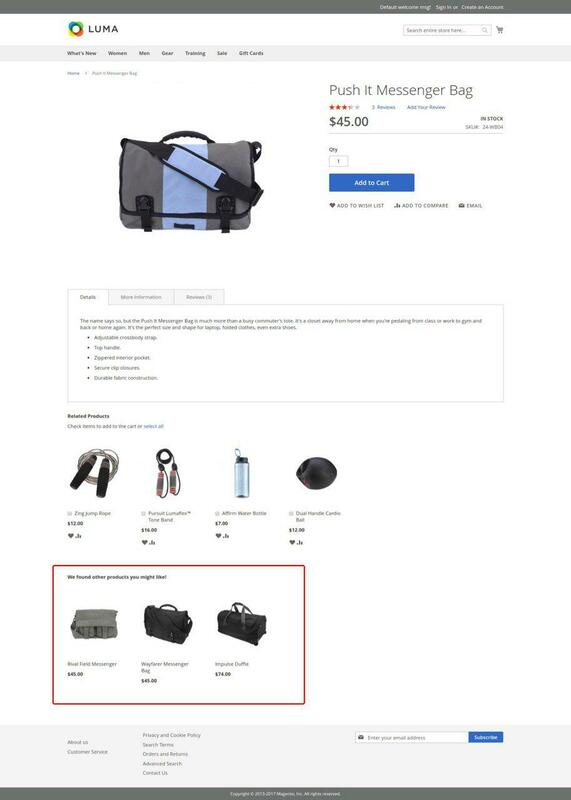 Choose the “Related Products, Up-Sells, and Cross-Sells” section, open it and press the “Add Cross-sell Products” button. Step 3. In the opened window select the cross-sell products. Then press the “Add selected products” button. The end. Think carefully about your customers, monitor the demand and purchase history and you will find up the sell and cross sell combinations that will help your ecommerce business to progress.